Quinoa is a well-known food that provides lots of nutrients. This plant is more than five thousand years old. It originated in the Andes in South America. Quinoa is considered a superfood because it boasts qualities that help your body heal and provide vitamins and minerals nourish. Quinoa is a good source of minerals such as calcium, magnesium, and potassium. It is also rich in vitamins, such as Vitamin E, riboflavin and folic acid. An well-known fact about quinoa, is that it is gluten-free. Thus, many people who are allergic to gluten enjoy the versatility of quinoa. Quinoa cooks fast. Within fifteen minutes you can have a bowl of quinoa all cooked, ready to be served. It is a grain that is available in red, black, white, or golden in color. However, the nutritional values are different with every color. You can make your own quinoa flour by grinding it in a blender or food processor. Quinoa flour has a nutty flavor. 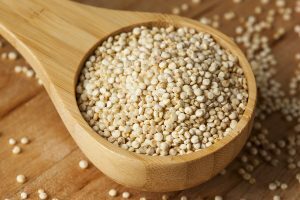 One interesting tidbit of information about quinoa is that the seed has a bitten resin called saponin. This is a bitter resin. If this outer layer is removed, the cooking time is reduced. According to the Whole Foods Council there are over 120 different varieties of quinoa. However, only a few varieties are grown commercially.